From Loose Parts by Lisa Daly and Miriam Beloglovsky, "Texture is a source of interest and information. It also denotes space and changes in areas of an object or environment" (38). Put paper plates, glue, and small bits of different textured items on a table. Ask: I wonder which things are soft? Which are bumpy? What other words can you use to describe how things feel? 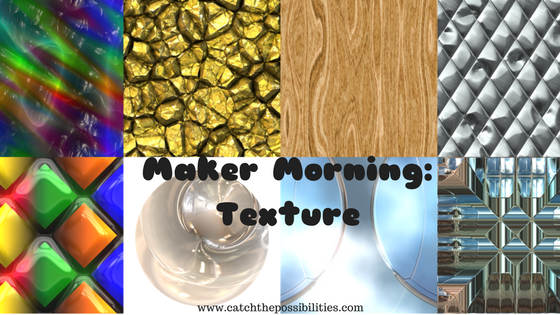 (The idea here is that the kids will create a "texture wheel" full of different things to touch that they can take with them). Need ideas for texture words? Here's a list with activity ideas.